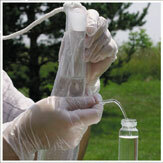 Purging, sampling and developing wells to a depth of 60 ft. The DC Purging Pump provides an easy-to-use, high-quality and economical solution for purging, sampling and developing wells to a depth of 60 ft (18 m). The upgraded motor in the pump provides a higher flow rate and higher long-term reliability than previous models. Two models are offered: the Single Pump (TR-040) and the Tandem Pump (TR-060). The Single Pump can deliver 5 gpm at ground level (no head) and pump water at depths of up to 45 ft. The Tandem Pump can pump from depths of up to 60 ft. See the pump performance curves on page 2. The pumps require between 8 and 14 V to operate and will achieve maximum flow at 14 V.
The pump’s 1.58″ (40 mm) diameter is ideal for use in 2″ or larger monitoring wells. Constructed of ABS plastic, the pump offers nitrile rubber seals and a stainless steel impeller with an inlet strainer to keep debris from fouling the pump. Both our models ship completely pre-assembled and packaged with leads and alligator clips to connect to a 12 volt battery terminal. The optional Cigarette Lighter Assembly (TR-207) makes it even easier top power the pump from a car battery. The pumps feature a heavy gauge cable to reduce voltage drop and all below water connections are hermetically sealed to ensure reliable operation. The pumps offer a connection port for a 3/8 or 1/2 in discharge hose. 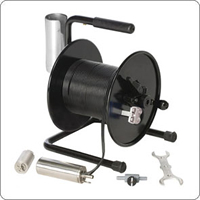 The Tandem Pump (TR-060) includes 65 ft of 16 gauge watertight motor lead with a quick connect pin and 5 ft battery lead with quick-connect adapter. This adaptor is normally connected to battery clips but is easily attached to the Cigarette Lighter Assembly (TR-207). 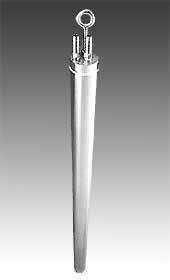 The Single Pump (TR-040) is similar except that the motor lead length is 45 ft.